The object here is to back your opponent into a corner where no matter whose creatures die(yours or theirs) it makes them lose life and you gain...and if they don't want to lose more life, you get your creatures back! Blood Artist and Zulaport Cutthroat bring the life loss/gain. Skirsdag High Priest turns death into a flying meat wall. Bitterblossom pumps out fodder for the death engine every turn, at a very reasonable price of 1 life. Considering that life is returned to you when the fairy dies, it's a great deal! Hidden Stockpile gives more token generation fueled from things you do anyway, so it's great value! Tragic Slip is hands down the best removal I can think of for this deck. 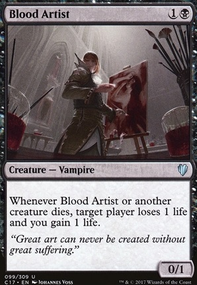 Since I plan on having a creature die on most turns, and have several ways to sacrifice my own creatures at instant speed, this can kill almost anything! Killing Wave is a nice finisher that makes your opponent choose between life and creatures, then if they choose life, they lose it anyway and you gain.... then back to Athreos! Westvale Abbey is another great win con in this life/death token deck! Promise of Bunrei is a card I have previously underestimated. In this deck, however, if you have a creature on board that can sac itself, you can play this, sac the creature, and turn one creature into 4! If your opponent decides to destroy the enchantment, you can simply sac a creature in response to trigger Promise of Bunrei . I 13;die, 13;you 13;die, 13;we 13;all 13;die, 13;bye 13;bye!